Reasoning Ability is an onerous section. With the increasing complexity of questions, it becomes hard for one to give it a cold shoulder. Earlier students used to have a mindset of ignoring the complex puzzles, thereby solving the other questions that were comparatively easy. But to their dismay, this strategy doesn't work anymore most of the questions from the other topics like directions, etc, too, are being asked in the form of puzzles. The only way to make the grade in this particular section in this year's IBPS PO/Clerk & IBPS RRB Pre/Mains Exams is to practice continuously with all your heart and soul. 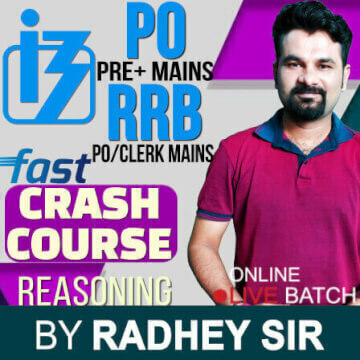 To help you come to grips with all the problems that you face while doing the subject, Adda247 brings to you a special online batch "Mission IBPS PO/Clerk Pre+Mains & RRB PO/Clerk Mains Complete Reasoning Fast Crash Course". Earlier only 100 seats were available for the batch but a huge number of students made a request to increase the number of seats and now we have increased the number to 150. There are students who have doubts regarding certain topics of this subject that will be asked in IBPS PO/Clerk & IBPS RRB PO/Clerk 2018 Examinations, they are not even able to clear the concepts on their own and want to join coaching classes for the same. This Online Batch is specially brought up for those who are not able to join classroom programs due to certain reasons. Also, a huge number of students apply and appear for these examinations every year and that's the reason why the fight to get through them is real tough. It's like shape up or ship out, so students, start off your preparations right away. And all that one needs to make the cut is a proper guidance in order to take steps in the right direction. The batch started on 15-Sept-2018 (Time: 08:00 a.m. - 10:00 a.m.) and the classes run from Monday to Friday for IBPS PO/Clerk & IBPS RRB Pre/Mains Examination 2018. There are a total of 150 seats for the batch and the candidate is required to have the minimum internet connectivity of 5MBPS to run the online classes without any interruptions. You will also be provided with Reasoning Topic Wise 10 Sets Online Test Series (Validity: 6 Months) and Bank Exam Reasoning 9 Ebooks (Validity: 6 Months). The candidates can freely ask their doubts during a separate doubt session and this is why you are required to have headphones/ earphones that have a mike too. The fee that is required to be paid for the batch is Rs. 1999/-. Join Mission IBPS PO/Clerk Pre+Mains & RRB PO/Clerk Mains Complete Reasoning Fast Crash Course Now! !